Fethullah Gulen sits in a room at his compound in Saylorsburg, Pa. He has lived in exile in the United States since the late 1990s. Turkish President Recep Tayyip Erdogan blames Gulen for last year's failed coup and is seeking his extradition. On July 15 last year, in an attempted coup, a faction of the Turkish military bombed government buildings, blocked roads and bridges and attempted to overthrow President Recep Tayyip Erdogan. The coup attempt was quelled by the next day — but Turkey has been feeling the repercussions ever since. The government has engaged in sweeping purges, arresting tens of thousands and firing more than 100,000 people from their jobs, including civil servants, university professors and soldiers. But the primary target of Erdogan's wrath is Fethullah Gulen, an Islamic scholar in his late 70s living in exile in the United States. Erdogan blames Gulen for masterminding the failed coup attempt. The government has declared Gulen's movement a terrorist organization. Gulen, who is said to have millions of supporters in Turkey, has steadfastly denied any responsibility for the coup — but Turkey is demanding his extradition from the U.S., where he has lived since the late 1990s. 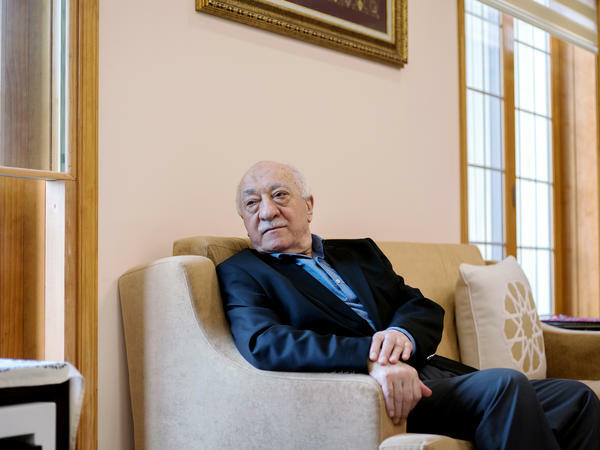 "To this day, I have stood against all coups," Gulen told NPR's Robert Siegel, who traveled Monday to the cleric's compound in Saylorsburg, Pennsylvania, in the Pocono Mountains. "My respect for the military aside, I have always been against interventions. ...If any one among those soldiers had called me and told me of their plan, I would tell them, 'You are committing murder.' "
Gulen, who rarely speaks with the press, expressed concern for Turkey's future, but has "some hope," he said. "If they ask me what my final wish is," he added, "I would say the person who caused all this suffering and oppressed thousands of innocents, I want to spit in his face." When asked if he was referring to Erdogan, he replied: "It can't be anyone else. He is the oppressor." NPR has sought comment from the Turkish embassy, which declined to issue a written response to Gulen's remarks. One other thing is I live here, thousands of miles away from Turkey. Some soldiers decided to do the coup, and despite the many questions and suspicions that remain of the government account of what transpired that night, if such claims are still taken to be credible, I shudder in astonishment. But if I were to humor that idea, if any one among those soldiers had called me and told me of their plan, I would tell them, "You are committing murder." I think the United States is mindful of its reputation for its democracy and rule of law, and if they are willing to risk that reputation by extraditing me based on the request and claims made by Turkey, I would never say no. I would go willingly. I am living my final years, even if they decide to kill me or poison me or bring back the death sentence to hang me. When I was a young imam back in the day, I was present at the execution of two men, and I asked them about their final wish. If they ask me what my final wish is, I would say the person who caused all this suffering and oppressed thousands of innocents, I want to spit in his face. The perception that I control all of this... that I tell people to do things and that they are doing them... there is no such thing. As I have said to one lawmaker, if there is any suspicion of secrecy, they should conduct deep investigations and expose it. I am not clear on what it is that is so secret, but they should send their law enforcement and intelligence services to uncover it. I firmly support that. Before I moved here, I always lived in Turkey and was subject to many difficult situations and targeted in the numerous military coups that happened over the years. ... I never really wanted to leave Turkey, but I had some heart problems and a cardiologist at the Mayo Clinic insisted that I come here and get treatment. So I traveled here and while I was in the hospital, a prosecutor in Turkey opened a case against me, so I was advised to remain here until things calmed down, but they never quite did. I don't want to be perceived as pretentious to Americans for speaking to an American outlet and for what I'm about to say, but I have always carried an admiration for the United States for its democracy and its leadership of the world. I had freedom here and for that, I decided to stay here. And a few years later, I received my permanent residency, and as such I am still here and I think it was a wise decision. I haven't ventured out of the retreat much, only to come and go to the hospital, as I prefer tranquility. [Erdogan] thinks that if he can eliminate me, everyone else in this movement will dissolve. ... Erdogan thinks if he gets rid of me, he thinks ending me will end the movement. He couldn't be more wrong. We are mortals, we will die one day. But this is a movement of love and dedication to humanity and God willing, the people who use their rationality and free will shall continue doing their great work. Turkey is a diverse country ...I think that democracy is the ideal system for a country with a social foundation such as this. My view is based on my belief that everyone should be able to comfortably live what they believe, and this is only possible in a truly democratic environment. I am insistent in my views and I strongly believe in what I say. In addition, I have previously expressed to others that the Turkish constitution should be modeled on the American constitution. America is a non-homogenous society of more than 300 million governed under such a constitution. It would be very effective for Turkey. Now a rare interview with a man who stands accused of orchestrating an attempted coup in his native country, Turkey, all of this from his home in the Pocono Mountains. Yesterday, he sat down with our colleague Robert Siegel at his compound in Saylorsburg, Pa.
ROBERT SIEGEL, BYLINE: I'm at the Golden Generation Worship & Retreat Center. It used to be a summer camp where Turkish-American families from New Jersey would send their kids to beat the heat here in the Pocono Mountains. Since 1999, the center has been home to one of the most influential and enigmatic religious figures in his native country, Turkey. Fethullah Gulen is a Muslim religious scholar and teacher. To his millions of followers, he is a guiding light. To the Turkish government of Gulen's one-time political ally, President Recep Tayyip Erdogan, he was the master plotter of last summer's failed military coup - a coup that left more than 200 people dead. Gulen denies it. Turkey wants the U.S. to extradite him and try him as a terrorist. Gulen's movement, it's called Hizmet, Turkish for service, operates schools around the world, including dozens of charter schools in the United States. His followers in Turkey became influential in education, in business and government. Since the failed coup of last July, they have been victims of a nationwide purge in Turkey. And that was the first subject I raised with Mr. Gulen when I interviewed him here at the center. FETHULLAH GULEN: (Through interpreter) These innocent people have been taken away as victims of groundless logic and in violation of rights and justice. SIEGEL: The deputy prime minister of Turkey says that the government has seized over 900 companies and institutions worth over $11 billion because they say those institutions were run by your sympathizers. Have they destroyed the institutions of the Gulen movement in Turkey? GULEN: (Through interpreter) It seems they have completely emptied out the assets of these companies and institutions. And I am not embellishing when I say that they are interested in closing their own budget deficits through these acquisitions. SIEGEL: One hundred forty thousand people have been purged from their jobs, 50,000 have been arrested. We asked the Turkish Embassy to respond to Fethullah Gulen's claims. The embassy declined to provide a statement in response. But we know what the government says about Gulen and what many of his critics and detractors say. They say his organization is secretive and opaque, a state within a state. I asked him about a British parliamentary investigation into last July's attempted coup. It found that Gulenist officers took part but so did other officers - some were secular, some were careerists, some were just following a superior's orders. That inquiry found no solid evidence that Gulen called the shots or that he's a terrorist. But it noted that the Gulen organization lacks transparency. And that makes it, and this is a quote, "impossible to confirm that all of its activities are philanthropic." Why do so many people in Turkey see the Hizmet movement as somehow secretive or conspiratorial? GULEN: (Through interpreter) The perception that I control all of this, that I tell people to do things and that they are doing them, there is no such thing. As I have said to one lawmaker, if there is any suspicion or secrecy, they should conduct deep investigations and expose it. I'm not clear on what it is that is so secret, but they should send their law enforcement and intelligence services to uncover it. SIEGEL: You would say this is not a hierarchical organization. Your critics all seem to think that if you say I think the following would be good for Turkey, hundreds of thousands of people in Turkey would do that because you said so. GULEN: (Through interpreter) All I have done so far is to give lectures and advice in mosques and conference halls. I spoke against poverty, divisions and ignorance. And I told my audience that investing in education is the best solution to these problems. I repeated this everywhere I went. And there were people who found this to be a right and rational cause, influenced by religious motivation. It cannot be said that this is a secret society or any such thing. I simply spoke, and they respected my words and ideas and established schools. SIEGEL: But you know how this is used against you. A critic of yours will argue that an officer in the army who reads you and who is inspired by you would never take part in a coup and an attempted coup unless he knew that you thought it was a good idea. GULEN: (Through interpreter) To this day, I have stood against all coups. I suffered during the military intervention of May 27, 1960 and then again on March 12, 1971 and again on September 12, 1980. And I was targeted after February 28, 1997. My respect for the military aside, I have always been against interventions. I don't know the people who attempted the July 15 coup last year. They might know me. They may have attended some lectures. I have no idea. SIEGEL: He denies that he ever communicated with any of the officers who tried to oust Erdogan last July. GULEN: (Through interpreter) But if I were to even entertain that idea, if anyone among those soldiers had called me and told me of their plan, I would have told them, you are committing murder. SIEGEL: And yet, Recep Tayyip Erdogan persists in blaming Gulen for the attempted coup. What complicates all this is that for a few years, Erdogan and Gulen were political allies. They both appeal to Islamic values in a country that is constitutionally secular. When they were on the same side, Turkish authorities mounted vast investigations of secular military officers and journalists. Many of those running the investigations were seen as Gulenists. But Gulen says they were not acting at his direction. GULEN: (Through interpreter) I guarantee you that I do not know even 1/10 of one percent of those police officers, judges and prosecutors. However, I am aware that they might have been sympathetic to the movement. I have no need to lie at this age. Erdogan used those officers, judges, prosecutors against people who were against him. SIEGEL: Then the targets of the criminal justice system turned from the military and the press to corrupt members of Erdogan's own party and government. The Gulenist judges tried to persevere and then the Gulen-Erdogan alliance was over. GULEN: (Through interpreter) Since Erdogan saw himself as virtuous and dignified, he was deeply disturbed when these allegations of corruption began to surface. His reputation and credibility were being severely damaged, and he viewed us as being responsible. He needed a scapegoat. SIEGEL: You're describing a political leader who is very - sounds very dangerous. Does he pose a danger to Turkey? GULEN: (Through interpreter) I don't see a bright future for Turkey. It pains me, but I have some hope. I pray for it to be better. It is a blessed country, a NATO member and was an EU candidate. These were things we wanted, to see progress and democracy, to see respect for diversity of thought. SIEGEL: It surprises many Americans to learn that the most famous Turkish Islamic scholar of our times, you, lives in the Pocono Mountains of Pennsylvania. Can you explain to an American simply why you're here? And are you concerned about being extradited and being taken away from here? GULEN: (Through interpreter) I never really wanted to leave Turkey. But I had some heart problems, and a cardiologist at the Mayo Clinic insisted that I come here and get treatment. So I traveled here while. And while I was in the hospital, a prosecutor in Turkey opened a case against me. So I was advised to remain here until things calmed down. But they never quite did. I haven't ventured out of the retreat much, only to come and go to the hospital, as I prefer tranquility. With regards to the extradition demand by Turkey, I think the United States is mindful of its reputation for democracy and the rule of law. And if they are willing to risk that reputation by extraditing me based on the request and claims made by Turkey, I would never say no. I would go willingly. I am living my final years, even if they decide to kill me or poison me or bring back the death sentence to hang me. When I was a young Imam a long time ago, I was present at the execution of two men, and I asked them their final wish. If they asked me what my final wish is, I will say the person who caused all this suffering and oppressed thousands of innocents, I want to spit in his face. SIEGEL: Are you speaking of President Erdogan? GULEN: (Through interpreter) It can't be anyone else. He is the oppressor. SIEGEL: Fethullah Gulen is nearing 80. He has suffered from coronary disease and what he's described as problems with his immune system. On the subject of his own mortality, he told me this. Erdogan thinks ending me will end the movement. He couldn't be more wrong. The people who use their rationality and free will shall continue doing their great work. [POST-BROADCAST CLARIFICATION: Former Turkish President Abdullah Gul visited Fethullah Gulen at Gulen’s retreat in Pennsylvania before he became president in 2007.] Transcript provided by NPR, Copyright NPR.